Oh! If you're looking for some great books to go along with this gorgeous craft, check out the links below! Ok! 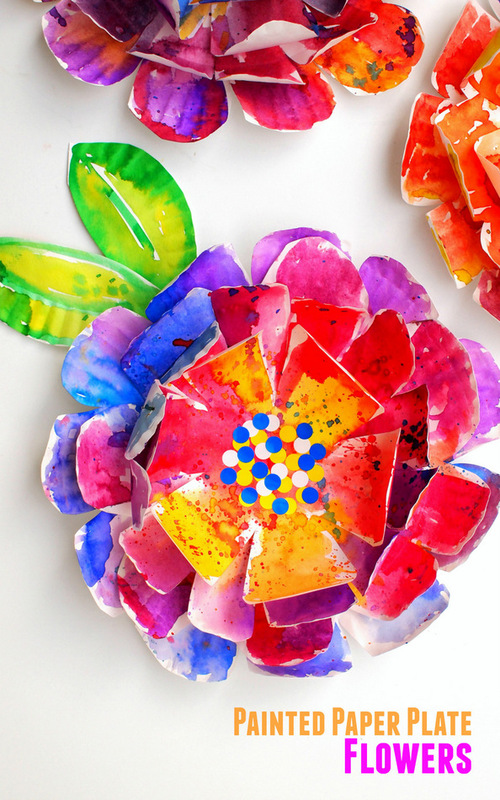 Let's make some beautiful paper plate flowers! Each flower consists of 4 cheap white paper plates . (I like the uncoated ones the best!) Then, I cut four different sized flowers from the plates. Then, I covered our work area (with an old Halloween tablecloth!). I poured a couple of drops of liquid watercolors into an old candy container, and we got painting! Side note: We LOVE our liquid watercolors. They are our current favorite art supplies. You don't need a lot and you always get such beautiful vibrant colors. Yes, your hands will get dyed in the process, but everything washes off. My son wasn't always into painting with me before because he didn't like getting Tempera paint on his fingers. Maybe it was a texture thing? But he really enjoys using this paint. Once everything dried, we covered the centers with circle stickers . We have over 30+ flower and plant crafts on the blog, and this one is definitely one of my favorites. 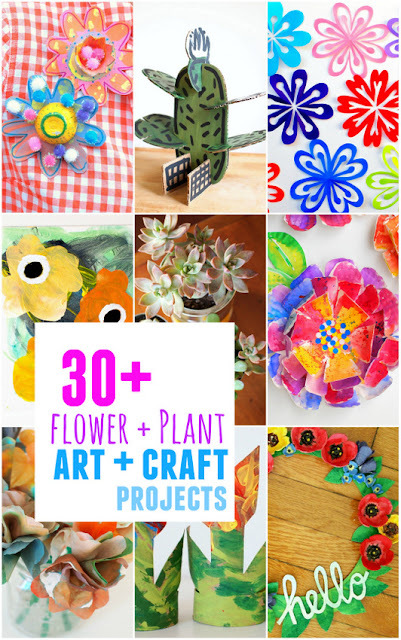 If you're still in the mood for flower crafts, definitely check out the whole list! And... if you liked this craft, you might also like these others too! These turned out amazing! Getting ready to try them out with my daughter now! Thanks! :) Awesome! Have fun and let me know how it goes! glad you enjoyed this craft! Sorry there isn't a template. You can cut the flowers however you like. just try to make them slightly different sizes to resemble a real flower! Sorry, there isn't a template. Just have fun and cut out flowers of various sizes. Hello, how did you achieve the multi colors on the leaves? Was that simply part of the process or was the paint slightly mixed? Simply part of the lovely process. :) We love mixing colors over here! Liquid watercolors. We love them because they're so vibrant! Hi Leslie, you website is adorable! All of your crafts look like so much fun. What great creative ideas you have and your photos show them off well. I will trying some out with the boys! Such a cute and inventive craft! I have been using liquid watercolors in some of my work for about three years now and have seen some amazing results! You get such a big difference from pan watercolors to liquid, the colors are brighter, you can mix them without having to worry about muddiness really at all that I have experienced. They are just great! It is worth the investment to keep your child learning and exploring new things and new ways to make beautiful art! Long live the kid artist, for they become our future!!! Thanks for sharing this with all of us! So glad you liked the craft! Thanks for visiting! Just discovered this wonderful art lesson! Thanks for sharing! Did you apply the paint with your fingertips or a brush? Paint brushes! Thanks for visiting! Looks like you stapled all the plates together and THEN painted?? Is that correct? Did you paint the outside or inside flowers first? Thanks ( : SO beautiful! Yup! Staple first and then paint.